As the world’s population edges towards 9 billion, the strain on the planet’s resources is steadily increasing. In both the developed and developing world there is a growing demand for better food, more manufactured goods and improved access to utilities such as clean water and electricity. These are needs that can only be met by intensifying production in all areas of industry, thus increasing the need for raw materials. In addition to the rapidly expanding demands on the world’s finite resources, a byproduct of increasing productivity is the production of unwanted chemicals which, when released into the environment, are often harmful. Since publication of the Bruntland report 30 years ago, it has become clear that increasing productivity without reducing the output of pollutants has serious consequences for the planet. Chemists have a major role to play in ensuring a continued supply of the fertilizer, medicines and other chemicals needed to support the world’s population. It is also their responsibility to design processes that reduce or eliminate the production of unwanted or hazardous chemicals that can potentially damage the environment. In 2012, as an extension of Millennium goals for the years up to 2015, the United Nations agreed to develop a set of Sustainable Development Goals (SDGs). by 2030 enhance international cooperation to facilitate access to clean energy research and technologies, including renewable energy, energy efficiency, and advanced and cleaner fossil fuel technologies, and promote investment in energy infrastructure and clean energy technologies. by 2020 achieve environmentally sound management of chemicals and all wastes throughout their life cycle in accordance with agreed international frameworks and significantly reduce their release to air, water and soil to minimize their adverse impacts on human health and the environment. 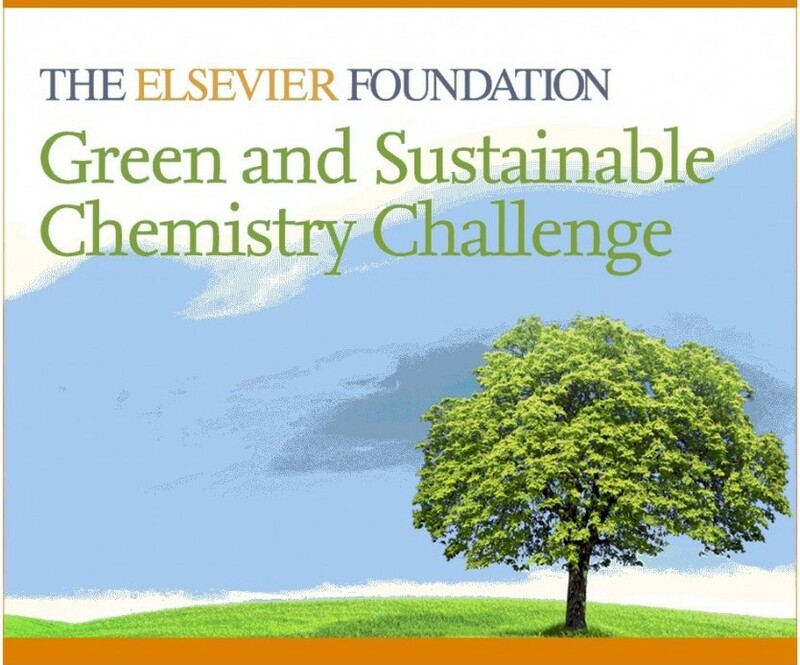 To encourage researchers to come up with new solutions, Elsevier organized this Green & Sustainable Chemistry Challenge. At Elsevier, it’s our vision is to create information solutions that improve outcomes for our customers and also benefit society. This challenge will enable us to work with the research community to make a positive impact on society. This year, the 2018 Elsevier Foundation Green and Sustainable Chemistry Challenge is looking for innovative, environmentally sustainable ideas. RELX Group and its businesses, including Elsevier, have a positive impact on the environment, principally through the information we produce which informs debate, aids decision makers and encourages research and development. We also have an impact through consumption of natural resources such as energy, water and waste generation, through our direct operations, supply chain and customer use of our products and services. We are committed to reducing any negative environmental impacts, while continually improving our environmental performance. Throughout 2014 we made good progress toward reaching our 2015 targets, achieving our goals for Scope 1, Scope 2, office energy use intensity and data centre energy efficiency. In the longer term, we aim by 2020 to achieve 100% of our electricity from renewables or Renewable Energy Certificates, and zero waste to landfill at key locations under our control. Although all environmental impacts are important, we prioritise climate change (we continue to produce more online products and services with associated energy usage and associated emissions) and water, given its use in our own operations and in our supply chain. We uphold our values in our supply chain by requiring our suppliers to meet the same high standards we set for our own behaviour. As a founding member of the Publishing Industry Product Safety Forum, we monitor our product safety standards encompassing ink, varnish, spiral wire, lamination, glue and packaging (defined as packaging materials or packaging components that enter landfills, waste incinerators, recycling streams and, ultimately, the environment). We go beyond minimum legislative requirements to eliminate substances of concern from our products and have mapped the second tier raw material suppliers of 93% of our first tier print suppliers by country and component category. These suppliers have confirmed that no substances of high concern are used in the manufacture of our products. To improve our environmental performance we engage in constant dialogue with a range of stakeholders, from employees to NGOs such as Earthwatch. We participate in sector initiatives such as the Publishers’ Database for Responsible Environmental Paper Sourcing (PREPS) and further our understanding through environmental benchmarking activities such as the CDP. We support progressive environmental legislation, and, in 2014, continued our involvement with the UK Aldersgate Group, which engages with government on environmental reporting and other key issues. In the year, we served on the steering committee of the Aldersgate Working Group exploring the potential benefits of a UK electricity and carbon labelling scheme, which resulted in a July 2014 report entitled Enable the Label. In October, businesses were invited to trial the electricity label on their UK energy supply. Employees are integral to our environmental improvement efforts and 66% of key locations have Green Teams. In 2014, we offered special events, training and competitions at locations throughout the year. In 2014, Elsevier Camden completed the move to a new office in the heart of the City of London. When more than 300 employees were relocated, old desks, chairs, computer equipment and other materials remained. Waste to Wonder, an organisation which we have worked with for nearly 10 years, helped us redistribute items to UK homeless charity Emmaus and the British Heart Foundation, while nearly five containers of furniture were sent to Agrolinks Academy in Kampala, Uganda, a school with over 2,000 students. Items that could not be reused were recycled. We make a positive environmental impact through our leading-edge environmental publications and services which spread good practice, encourage debate, and aid researchers and decisions makers. They range from journals like Water Research, magazines such as New Scientist and The Environmentalist, databases such as ScienceDirect and Scopus, and exhibitions including Pollutec and World Future Energy Summit. Five candidates were selected by the judges from the Green and Sustainable Chemistry Challenge and invited to the Green and Sustainable Chemistry Conference. The applicants presented their proposals at a session in the beginning of the conference. At the end of the conference the winners were announced. Stay informed by signing up to our latest updates. For further details please contact Ylann Schemm, Director of Elsevier Foundation.